I’ve been looking into Decision Management over the last few days. It is an excellent topic I’ve been missing out for quite some time. A brief description of what I understood so far from it, is a set of methodologies to provide a closed cycle for knowledge management systems, from the point of knowledge discovery and formalization, to exposing it through a knowledge runtime and providing feedback to the knowledge discovery. This last part, the feedback, is a component I’ve always wondered if was possible to build as part of the tooling that Drools provides. The idea behind it is having an environment where you can play with data from your production systems, finding all sorts of combinations that you weren’t paying attention to before, either because you planned them for later, or because you didn’t thought of that condition was appearing in your environment. This is not always something you want to do so lightly, specially when you’re handling private or sensitive information in your working memory, but after a certain amount of filtering, it is something that you would like to consider a good place to start searching how your environment is working in production. Simulation generation: Another heavy task. Once you find the patterns that would identify your new cases, or improve your existing cases, you might want to do changes to your knowledge definitions to see how they behave with the existing data. If they work well, you will want to apply the new knowledge definitions to the real production system, but not before. The branch that targets this analysis is called predictive analytics, because it goes further from just making realtime analysis of data, but also focuses on discovering trends of change in your production environments to be suggests new ways in which production data might be getting inside your environment in a few minutes, hours, months, and so on depending on how far back the production data involved in the discovery process goes. All these analysis are usually possible because they are thought to be conducted from Big Data. This is the part where Drools puts a distance with Decision Management Software. Drools production data (the working memory) lives in memory. It can be persisted, but even if it is, it is just a serialized blob of information to restore the session elsewhere. So, even if we did these analytical tools for Drools, they would have to work on memory. This got me thinking if these sort of analysis could be done on top of a Drools rule engine. We certainly do have some tools in DRL to provide us with analysis capabilities. DRL Queries can give us insight on any specific working memory using the same search patterns that rules use. The one thing it would be able to do is provide us with easy grouping, but rules and specific facts for carrying grouping information could do this quite easily. Let’s say that, for the simulation environment where we will run our analytics, we were going to build an entirely new system from scratch. Some things might be easy to create, some not so much. Usually when we do this, it is because we have an already existing application dedicated to this, and want to use it for analyzing our Drools environment, so we will assume the environment already exists. But what do we have to build for it? As you see, the first thing we will need is a way to send new information to Environment B. Session persistence could take care of this, but usually when we run complex working memories we don’t usually persist in order to gain maximum performance. In this scenario, we would use a single component of persistence: session serialization. Using any pluggable communication methods, we could create a communication between two environments to share the same session , even if that session is not persistent. Fortunately, there is an alternative to writing your own editors that would facilitate development a lot. That is, using the guvnor editors for rules to construct a query editor you could use from your application. That leaves environment B to worry only about having an execution environment for execution of simulation scenarios. 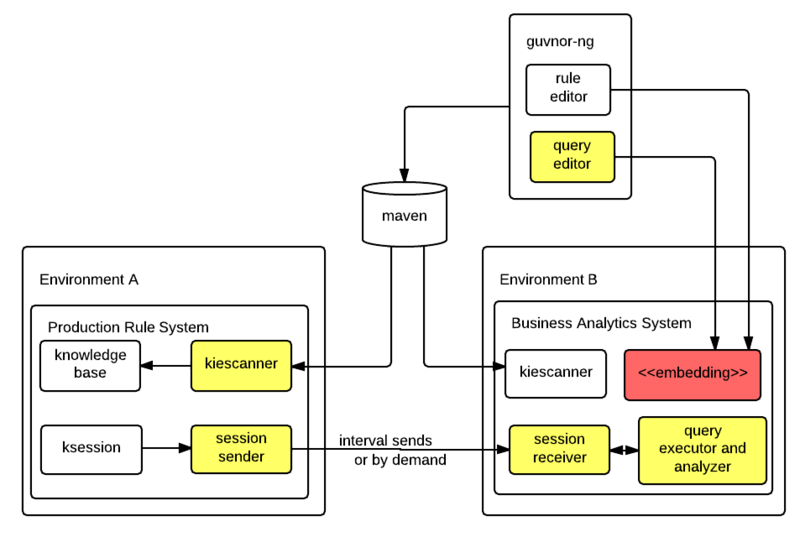 It also facilitates deploying, because if you use guvnors internal build and deploy functionality, all new knowledge definitions could be implemented in your production environment by using nothing else than the KieScanner, provided by the kie-ci dependency in Drools 6. The one problem it would have is that it would have to embed existing editor inside your own applications. It is a very reasonable consideration most Drools tooling users want to be able to do, but for the moment, it is rather complex to integrate. Perhaps there is a way to have everything environment B has in a single place? Of course, these are just theoretical components for the moment, but they would be very possible to implement. They would provide a huge added value to the discovery stages of knowledge development for Drools tooling. Development over the next few months could prove me wrong, but I hope it will not, as I also hope you found this analysis of drools analytic possibilities informative.